For sticker making, laminating, and magnet making fun, see the products that started it all. Whether in the classroom or the office, the Xyron products can handle all of your document finishing needs. The easy-to-use Xyron instantly applies adhesive, laminates, does both at the same time, or makes a magnet without heat or electricity. Simply feed an item in, turn the handle and trim. That’s all there is to it. The patented quick-change cartridges allow you to easily switch from laminating a proposal to applying adhesive to create an instant sign. All of this from one little machine with a really big idea. The demo requires Quicktime video 4.0. 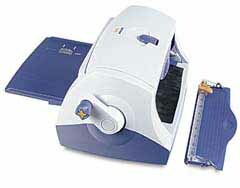 Xyron 900 creates stickers, magnets, labels and laminates items up to 9.0" wide.